I got to thinking about this piece after perusing Ken Leslie's Oil Pastel book. He uses a lot of curved horizons in his work and wacky perspective and I thought about that "global warming" piece I'd been playing with. I'm struggling with this long, albeit mild, NEngland winter and thinking fondly of my partner who is enjoying the warm breezes and tropical sun. 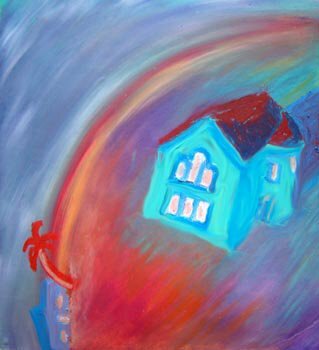 Here I'm depicting my southern and northern homes and for me the conflict of not being with him under palm trees.